This Lariat set is beautifully hand beaded one bead at a time with hundreds of small size 11/0 Cz Seed Beads in red, black, yellow, and white on a turquoise background. It features a zig zag geometric design with a traditional medicine wheel symbol in the four direction colors as well as a feather as the focal point. This item is on Close Out and will be discontinued once our current supply is exhausted. All closeout sales are final. The lariat necklace is 1.5 inches wide (3.8 cm) and is adjustible from 25" - 29" long (63.5 cm to 73.7 cm) with an extender chain at the back of the neck. 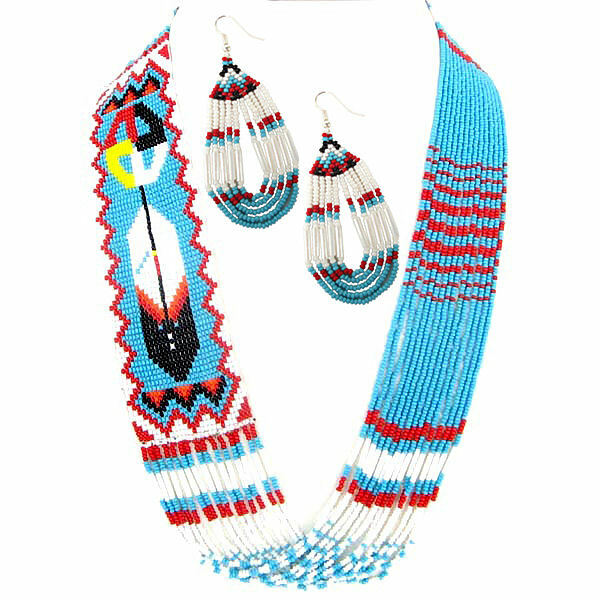 This beautiful beaded jewelry set is hand crafted - ONLY TWO AVAILABLE!